It is beautiful in Philadelphia, sunny, breezy, early-summery and also sometimes hot and humid. The vegetables are overflowing the raised beds and tumbling out of the CSA box and my fridge is packed. And I’m loving every minute of it. But I need to eat a lot of vegetables to keep up, and lately I just haven’t really felt like curries or stirfry or braises or casseroles. Why turn on the oven? So I’ve been enjoying a whole lot of raw salads. The secret about raw salads is that you can eat almost any green raw. If it is particularly tough, just marinate and massage it a bit. I currently have lots of vegetables in the cabbage family, so I thought it would be fun to combine them for varying textures and colors. The above salad I made one evening and ate un-marinated, then poured the dressing over top, marinated overnight, and took for lunch the next day. 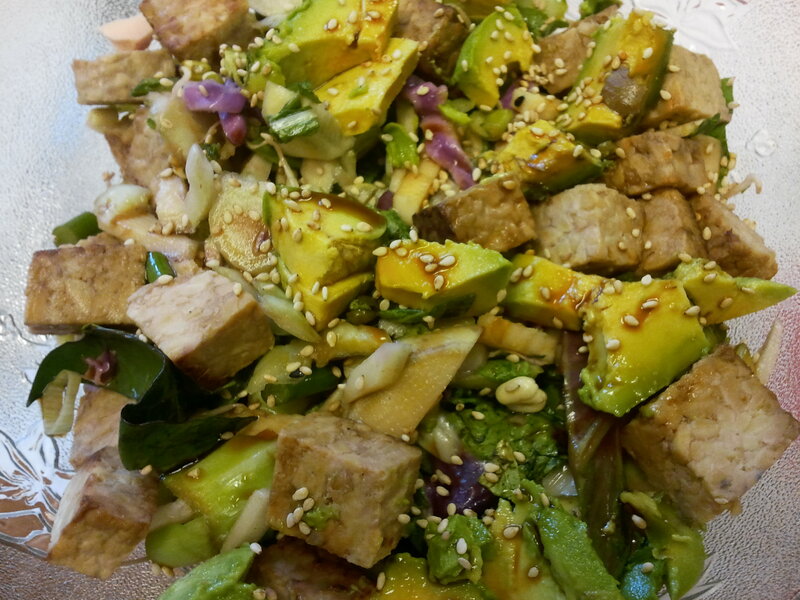 For lunch (and the above photo) I added some cubed and fried tempeh chunks, and half of an avocado. YUM. Combine vegetables in a large bowl. Drizzle dressing on top or, for a “softer” salad with less crunch, add dressing, mix well (use your hands!) and allow to rest for at least an hour. This recipe allows for 4 large servings. For a heartier meal, add tempeh, tofu, or avocado!